It consisted of a large flat box fully three feet long and eight or ten inches high filled with heavy stones. Underneath were wooden rollers called “pins” three or four inches in diameter. The articles to be mangled were carefully wrapped round the pins and the box was, by a rope pulley, drawn back and forward over the pins which revolved under it. The charge for mangling was one half-penny per pinfull! In most Iowa homes this third day of the week is reserved for ironing. The whole day should be reserved to complete this job. 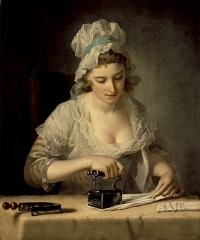 Why should not the little lady have her little ironing-box, and undertake the ironing of the pocket-handkerchiefs? No-one can say exactly when people started trying to press cloth smooth, but we know that the Chinese were using hot metal for ironing before anyone else. Pans filled with hot coals were pressed over stretched cloth as illustrated in the drawing to the right. A thousand years ago this method was already well-established. Meanwhile people in Northern Europe were using stones, glass and wood for smoothing. These continued in use for "ironing" in some places into the mid-19th century, long after Western blacksmiths started to forge smoothing irons in the late Middle Ages. Flattish hand-size stones could be rubbed over woven cloth to smooth it, polish it, or to press in pleated folds. Simple round linen smoothers made of dark glass have been found in many Viking women's graves, and are believed to have been used with smoothing boards. Archaeologists know there were plenty of these across medieval Europe, but they aren't completely sure how they were used. Water may have been used to dampen linen, but it is unlikely the smoothers were heated. More recent glass smoothers often had handles, like these from Wales, or the English one in the picture (left). They were also called slickers, slickstones, sleekstones, or slickenstones. Decorative 18th and 19th century glass smoothers in "inverted mushroom" shape may turn up at antiques auctions. Occasionally they are made of marble or hard wood. Slickstones were standard pieces of laundering equipment in the late Middle Ages, in England and elsewhere, and went on being used up to the 19th century, long after the introduction of metal irons. They were convenient for small jobs when you didn't want to heat up irons, lay out ironing blankets on boards, and so on. Other methods were available to the rich. Medieval launderers preparing big sheets, tablecloths etc. for a large household may have used frames to stretch damp cloth smooth, or passed it between "calenders" (rollers). They could also flatten and smooth linen in screw-presses of the kind known in Europe since the Romans had used them for smoothing cloth. Later presses (see right) sometimes doubled as storage furniture, with linen left folded flat under the board after pressing even when there were no drawers. Even in modest homes with no presses, large items needed to be tackled with something bigger than a slickstone. They could be smoothed with a mangle board and rolling pin combination; many wonderfully carved antique Scandinavian or Dutch mangle boards have been preserved by collectors. The board, often carved by a young man for his bride-to-be, was pressed back and forth across cloth wound on the roller. In England boards, paddles or bats like these were called battledores, battels, beatels, beetles, or other "beating" names. In Yorkshire a bittle and pin was used in the same way as the Scandinavian mangle board and roller. The earlier mechanical mangles copied this method of pressing a flat surface across rollers. The box mangle was a heavy box weighted with stones functioning as the "mangle board", with linen wound on cylinders underneath, or spread under the rollers. The boards/bats used for smoothing were similar to wooden implements used in washing: washing beetles used to beat clothes clean, perhaps in a stream. Sometimes they were cylindrical like the mangle rollers, sometimes flat. Instead of pressing you could simply whack your household linen with a bat/paddle against a flat surface, as witnessed in the Scottish Borders in 1803 by Dorothy Wordsworth. Early box mangles (see left-hand column), like Baker's Patent Mangle, were devised for pressing and smoothing. Mangles with two rollers (above left) could also be used for wringing water out of fabric. Many Victorian households would complete the "ironing" of sheets and table-linen with a mangle, using hot irons just for clothing. In the UK laundry could be sent for smoothing to a mangle-woman, working at home, often a widow earning pennies with a mangle bought by well-wishers after her husband's death. In the late 19th/early 20th century US commercial laundries described the mangling or pressing of large items as "flatwork" to distinguish it from the detailed ironing given to shaped clothing. Blacksmiths started forging simple flat irons in the late Middle Ages. Plain metal irons were heated by a fire or on a stove. Some were made of stone, like these soapstone irons from Italy. Earthenware and terracotta were also used, from the Middle East to France and the Netherlands. Flat irons were also called sad irons or smoothing irons. Metal handles had to be gripped in a pad or thick rag. Some irons had cool wooden handles and in 1870 a detachable handle was patented in the US. This stayed cool while the metal bases were heated and the idea was widely imitated. (See these irons from Central Europe.) Cool handles stayed even cooler in "asbestos sad irons". The sad in sad iron (or sadiron) is an old word for solid, and in some contexts this name suggests something bigger and heavier than a flat iron. Goose or tailor's goose was another iron name, and this came from the goose-neck curve in some handles. In Scotland people spoke of gusing (goosing) irons. You'd need at least two irons on the go together for an effective system: one in use, and one re-heating. Large households with servants had a special ironing-stove for this purpose. Some were fitted with slots for several irons, and a water-jug on top. At home, ironing traditional fabrics without the benefit of electricity was a hot, arduous job. Irons had to be kept immaculately clean, sand-papered and polished. They must be kept away from burning fuel, and be regularly but lightly greased to avoid rusting. Beeswax prevented irons sticking to starched cloth. Constant care was needed over temperature. Experience would help decide when the iron was hot enough, but not so hot that it would scorch the cloth. A well-known test was spitting on the hot metal, but Charles Dickens describes someone with a more genteel technique in The Old Curiosity Shop. She held "the iron at an alarmingly short distance from her cheek, to test its temperature..."
The same straightforward "press with hot metal" technique can be seen in Egypt where a few traditional "ironing men" (makwagi) still use long, heavy pieces of iron, pressed across the cloth with their feet. Berber people in Algeria traditionally use heated metal ovals on long handles, called fers kabyles (Kabyle irons) in France, where they were adopted for intricate ironing tasks. If you make the base of your iron into a container you can put glowing coals inside it and keep it hot a bit longer. 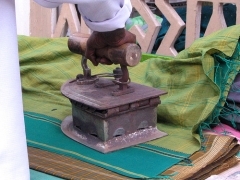 This is a charcoal iron, and the photograph (right) shows one being used in India, where it's not unusual to have your ironing done by a "press wallah" at a stall with a brazier nearby. Notice the hinged lid and the air holes to allow the charcoal to keep smouldering. These are sometimes called ironing boxes, or charcoal box irons, and may come with their own stand. For centuries charcoal irons have been used in many different countries. When they have a funnel to keep smokey smells away from the cloth, they may be called chimney irons. Antique charcoal irons are attractive to many collectors, while modern charcoal irons are manufactured in Asia and also used in much of Africa. Some of these are sold to Westerners as reproductions or replica "antiques". Some irons were shallower boxes and had fitted "slugs" or "heaters" - slabs of metal - which were heated in the fire and inserted into the base instead of charcoal. It was easier to keep the ironing surface spotlessly clean, away from the fuel, than with flatirons or charcoal irons. Brick inserts could be used for a longer-lasting, less intense heat. These are box or slug irons, once known as ironing boxes too. In some countries they are called ox-tongue irons after a particular shape of insert. Late 19th century iron designs experimented with heat-retaining fillings. Designs of this period became more and more ingenious and complicated, with reversible bases, gas jets and other innovations. See some inventive US models here. By 1900 there were electric irons in use on both sides of the Atlantic. Ironing continued to be done with hot coals in open metal pans in China, the basic principles no different from an enclosed charcoal iron. Pan irons could be simple or highly decorative. Further west, clay smoothers were sometimes used. Solid ones could be heated for pressing. Others were designed to hold hot embers like the North African terracotta iron on this page. 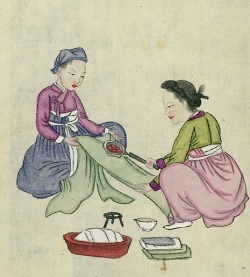 The ladies preparing newly-woven silk in a 12th century Chinese painting are using a pan iron, in the same way as the ironers in the 19th century drawing at the top of this page. Although that drawing comes from Korea, Koreans were traditionally known for smoothing their clothes with pairs of ironing sticks, beating cloth rhythmically on a stone support. A single club for beating clothes smooth was used in Japan, on a stand called a kinuta. In many parts of the world similar techniques were used in both cloth manufacturing and laundering: in Senegal, for example.